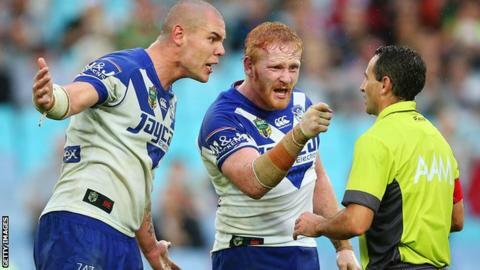 Ex-St Helens prop James Graham has been banned for four matches for his conduct in an NRL game which ended in crowd trouble and an injury to an official. The 29-year-old Canterbury skipper was punished for his late tackle on South Sydney's Adam Reynolds and for his reaction to referee Gerard Sutton. Bulldogs fans then targeted officials after their team lost 18-17 because of the resultant penalty against Graham. One official was injured after supporters threw bottles. New South Wales police said another official injured a shoulder in falling. They have identified two people for "allegedly throwing bottles". Graham's team-mates David Klemmer and Sam Kasiano were also suspended. Klemmer, sin-binned for abusing the referee for the Graham decision, has been banned for three matches, while Kasiano gets a two-match ban after being found guilty of dangerous conduct.